Twelve years ago, theater goers were urged to measure their life "in daylights, in sunsets, in midnights, in cups of coffee, in inches, in miles, in laughter, in strife," and definitely, through seasons of love." The award-winning rock musical Rent has already ended its run in Broadway but in Manila, theater goers can still measure in love! Produced by 9 Works Theatrical and directed by Robbie Guevara, Rent will open in Manila by February 2010. Set on the Lower East Side of New York City, Rent written by Jonathan Larson is the story of young bohemians Mark, Roger, Maureen, Tom Collins, Angel, Mimi, Joanne, and their friends—all struggling to create and survive during the rise of the mysterious, deadly AIDS disease, and the ever prevalent economic crisis. Socially relevant, youthful, and moving, Rent lives on, along with the affirmation that there is "no day but today." Rent premiered on Broadway in 1996 and it has been translated into 15 languages in 25 countries, captivating audiences all over the world. On that same year, Rent won the Pulitzer Prize for Drama and four Tony Awards (Best Musical, Best Score and Best Book—Jonathan Larson, and Best Featured Actor in a Musical—Wilson Jermaine Heredia ), among others. Rent The Audition is looking for males and females age 18 and above who can sing, dance and possess a deep passion for musical theater. Roger Davis - tenor, 20s; Mark Cohen - baritone / tenor, 20s; Mimi Marquez - mezzo soprano, 18 - mid 20's; Maureen Johnson - mezzo soprano with belt, 20s; Angel Schunard - tenor / soprano, 20s; Tom Collins - baritone, 20s to mid 30s; Benjamin Coffin II - baritone, 20s; Joanne Jefferson - alto / mezzo-soprano, 20s to mid 30s; chorus - all voice types, 18 and above. The dates of registration are on October 9, 10 and 12, from 10 a.m.-8 p.m. at Suite 302, Manila Luxury Condominiums, Pearl Drive, Ortigas Center, Pasig City. Kindly bring a copy of resume with your latest photo (3R). Online registration will be open on October 12 & 13 at www.9workstheatrical.com. Auditions are set on October 16 and 17. Please bring your own music sheets and/or minus-one. Prepare to sing two (2) pop-rock songs that will show your vocal range. Songs from Rent or any other Broadway musical WILL NOT be allowed. Rent is presented through special arrangement with Music Theatre International (MTI), 421 West 54th Street, New York, New York. 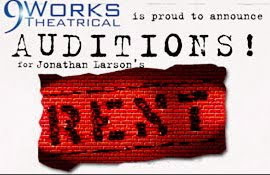 For further inquiries, please contact JonJon Martin at +63.916.651.6287 or email rent_auditions@9workstheatrical.com or visit the website: www.9workstheatrical.com. We'll see. Are you goin?